Bought the last one at my local Aldi for $169 last night. Queen size. 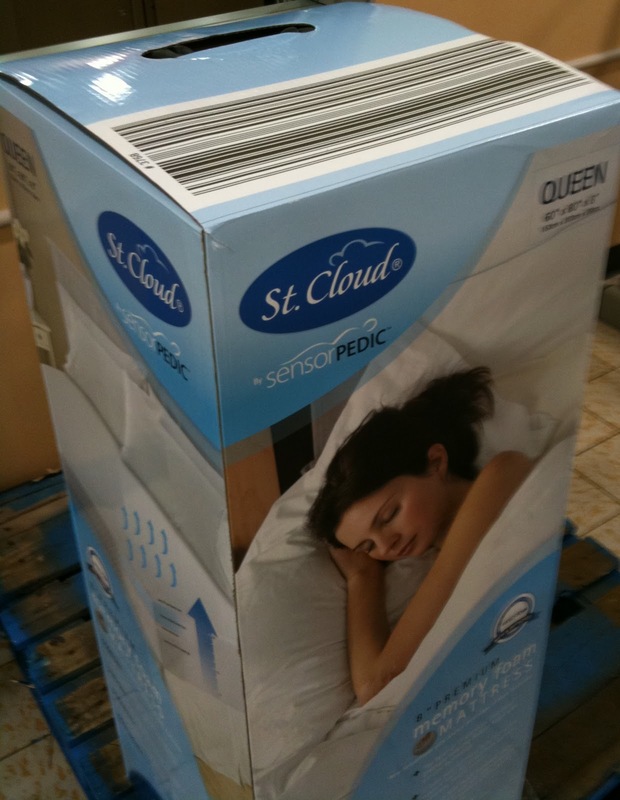 Manufacturer is Soft-Tex, brand is Sensorpedic, inside an Aldi St. Cloud box. Made in China, which is disappointing, but there are positive reviews on SlickDeals and FatWallet. Chemical smell is mild; you have to put your nose up to it to smell anything. Nothing like the Sealy mattresses at Costco that I could smell from 5 feet away. Still, am going to let it air out for a few days. Bed hasn't fully decompressed yet -- takes 3-6 days for that depending on room temperature -- but seems fairly firm and comfortable so far. Was amazed to see it at Aldi after almost getting the Spa Sensations mattress at Walmart the same day - at a higher price. Aldi has a 30-day return policy. Bed has a 20 year warranty. Hopefully won't need to use either one. Box says 8" height. Actual height is 7.75" after 6 days of decompression. Like most foam mattresses, including Tempur-Pedic, it's not one solid piece of foam. This one from Aldi is 4.75" of solid foam topped by 3" of low-density memory foam. Everyone sleeps differently, but for me, this bed took a week to get start getting used to, and a month to fully settle in. Am normally a side-sleeper, and woke up as achy as my previous mattress for the first few nights. If I sleep on my back, it's fine. I don't know if Aldi still sells these. I found what appears to be the latest version of this mattress at Amazon for $247. (as of this writing) That's a pretty good deal, as it normally averages $298 at Amazon. The Amazon version also has a nicer fabric cover and better ventilation. Any questions? Post in the comments. Do you know where to get one of these besides ALDI? Hi, I found what appears to be the latest version of this mattress at Amazon for $247 (as of this writing) with free shipping. Here's a link to it: http://amzn.to/1FQj0rh Please note that it's an affiliate link, which will help support me a tiny bit if you happen to make a purchase at Amazon. I will also update the post with this link. Thanks!